Championship Singles: Finals played 24 March. The Men’s Champion is Paddy Breslin with Brendan Nye runner up and the Women’s Champion is Chris Robson and Sandy Booth the runner up. Well done to all. Both finals were very close games with some wonderful bowls played by all. The Champion of Champions is this weekend – both the women & men playing at Silverstream. Unfortunately Paddy will not be playing. We wish Chris Good luck/good bowling. Please support her if you can. Gee Shield has concluded for the season. Petone Central has won the Shield. Champion of Champion Fours held at Naenae. Our Women’s team – Sandy, Lynda, Robyn, Sharon progressed through to the Quarter finals but unfortunately lost to Stokes Valley. They were thrilled to have such support from our Club members for this event and thank all those who turned up to watch. The men defaulted from the event. Champion of Champion Junior Singles which was postponed due to the weather has now been scheduled for 14 April and will be played at Island Bay. Champion of Champion Triples are also on that weekend. If anybody is still in the Triples at the end of play on Saturday arrangements to continue the Triples on another day will be made at that time. The draw is on the noticeboard at the Club. Our women’s team (Val, Dawn & Robyn) have a bye into the second round and will be playing Johnsonville. Our Men’s team (Brendan, Hugh & Byron) are playing Lyall Bay at 8.30 am. Both Men and Women are playing at Naenae. Good luck to both our teams. The Masters were held recently. We had four of our women Debbie, Patricia, Chris and Val in the Hutt Valley team. Paddy Breslin was the only member from our Club selected in the Men’s team. Hutt Valley won both events – so well done to our club members for their part in this win. Women’s Pennants final results: Our Premier team came 4th, our Division 1 team also came 4th and our Division 2 team slipped down to 6th place due to their games having to be defaulted. Men’s Pennants final results: Our Division 1 team came 3rd, Division 3 came 6th and Division 4 2nd equal. Amendments to the Laws of Bowls. Some amendments have been made – see notice on Notice Board for details. Men’s and Women’s Development 242 Pairs (1-10 yrs Incl) held on 30, 31st March & 1 April. The exciting outcome is that our ladies – Robyn & Lynda (right) won the Women’s event! Once again our team had great support from our Club Members and a big thank you from them for this. Our other teams in the event were Kaye/Carole, Marilyn/Jilly & Kevin/Byron. Marilyn & Jilly, Kevin & Byron qualified but unfortunately didn’t progress further. Well done to all. 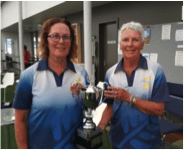 The continuation of the postponed post section of the Women’s Centre Triples were held on 10 March at Naenae (Indoors) Our women’s teams (Patricia, Debbie & Robyn; Sandra, Sharon N & Kaye) had a bye into the quarter finals but unfortunately did not progress beyond this. However Patricia’s team had a very close game and lost by 1 point. Well done to all. Gibbons Trophy (1-5 years) – 7 April – we have 2 teams in this event – team selections are on the Noticeboard in the Clubrooms. The Men’s and Women’s Easter 242 Pairs is also coming up – entries close 8 April and it is on 19 – 22 April. We have 2 teams of men and 4 teams of women entered so far – Ken/Chris, Paul (Ringo)/Brendan, Sharon/Robyn, Patricia/Debbie, Chris/Val & Sandy/Sheryl. A big thank you to Sharon for her organisation of several corporate functions over the past few months – several rather big groups. Also many thanks to those who have come forward and assisted. The National Fours Championships were played in the Wellington area on 1 March. We had 2 women’s teams entered – Chris, Patricia, Val & Sheryl and Sandra, Robyne Walker, Marilyn & Kaye (a composite team). Both teams qualified but lost their post section games. The Annual General Meeting is scheduled for 23 June. Note it on your calendars now. Nomination forms are up on the noticeboard – please give serious consideration to stand for one of the committees. On Saturday it is the annual Rugby Tournament at the club. There will be no disc draw that day. Don’t forget our sponsors –please use their services wherever/whenever you can. • It would take 100,000 years travelling at the speed of light to cross the Milky Way. • The Coliseum in ancient Rome had 24 lifts manually operated by more than 200 slaves.